Back in 2011 we had an event at Beer Belly called Craft for Crap. It was our way of encouraging craft beer drinkers to reach out to their non craft drinking friends, and bring them out so they can see what craft beer was all about. Like many of you, we had a good laugh during the Super Bowl watching a Budweiser commercial that was filled with hypocrisy and just plain short-sightedness. The craft beer community is not just a couple of mustached hipsters smelling their beers in a booth isolated from the rest of the world. Our community represents all kinds of people from different walks of life. That is what makes the Beer Belly experience fun and rewarding. That is what makes the craft beer community so fulfilling. 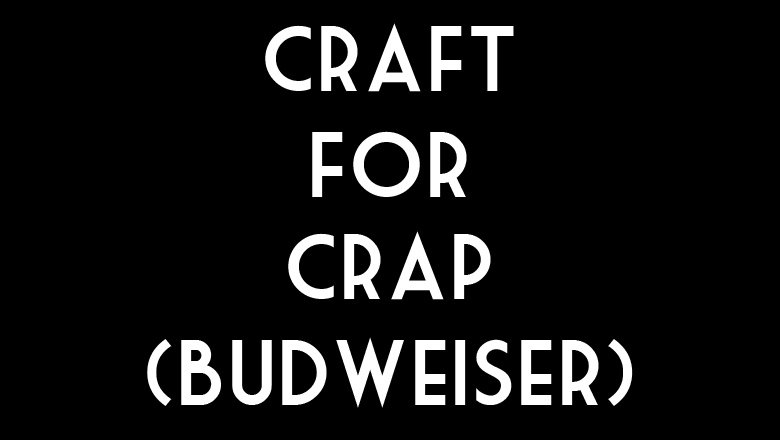 Anyway, this Saturday we're bringing back Craft for Crap. We want as many people as possible to grab any variant of Budweiser that may be in their fridge, attic, car trunk (edit: please don't go out and buy beer for the purposes of participating) and bring it to Beer Belly on Saturday from 12-4pm. We will go ahead and trade you for a craft beer for $.01. We can fuss over our beer, drink it, talk about it, whatever the hell you want. Bring in any Budweiser and we will exchange you a craft beer (draft only) for $.01. Bring as many crap (Budweiser) beers as you want, but maximum one $.01 craft beer per person. Bring your non-craft drinking friends. Show them what's up.